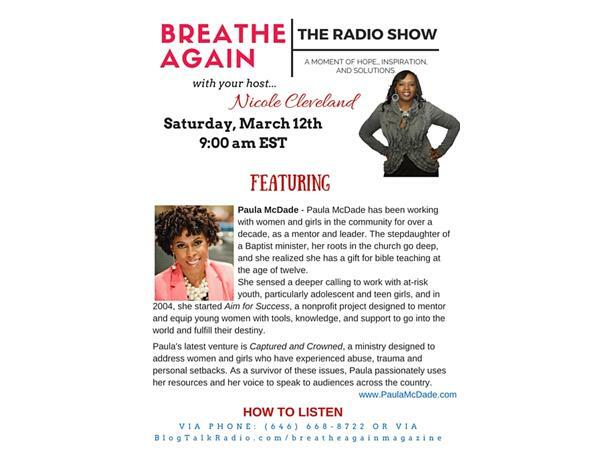 Paula McDade has been working with women and girls in the community for over a decade, as a mentor and leader. She sensed a deeper calling to work with at risk youth, particularly adolescent and teen girls, and in 2004, she started Aim for Success, a nonprofit project designed to mentor and equip young women with tools, knowledge, and support to go into the world and fulfill their destiny. Her newest venture is Captured and Crowned, a ministry designed to address women and girls who have experienced abuse, trauma and personal setbacks. As a survivor of these issues, Paula passionately uses her resources and her voice to speak to audiences across the country. She usually finds that her audience consists of women and girls struggling with their identity, after surviving abuse or trauma. Listen as we chat about her mission to help women and girls struggling with identity issues.